Internet for the whole world, courtesy of Facebook. As the post from Zuckerberg shares, Facebook’s Connectivity Lab achieved a record data beaming rate last Thursday – roughly 20 Gbps over 13 km (around 8 miles). 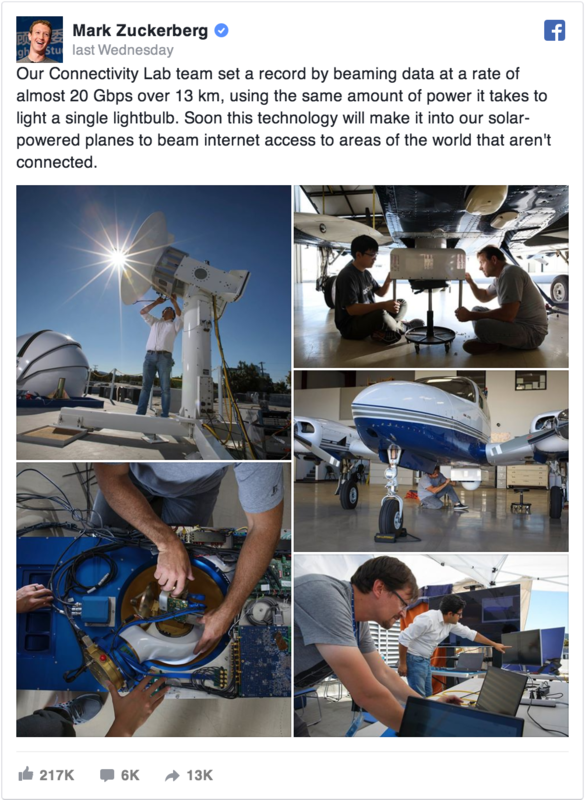 It was all done rather efficiently, using the same amount of power it takes “to light a single lightbulb.” Facebook’s Connectivity Lab plans to install this technology into Aquila, their solar-powered internet-beaming drones, which were also launched earlier this year. According to the project’s page, at the end of 2015 “more than 4 billion people were still not connected to the internet, and 10 percent of the world’s population were living outside the range of cellular connectivity.” Zuckerberg aims to change that. Equipping Aquila with an effective way to beam internet signals as it soars 18.3 km (60,000 ft) above us. Facebook was able to achieve quite a remarkable feat in a relatively short amount of time, since the project’s inception. It’s worth noting that this isn’t the only initiative Facebook’s founder is involved in. The Chan Zuckerberg Initiative is also currently working on its medical research project called Biohub, in hopes to cure all diseases in the Zuckerberg children’s lifetime.